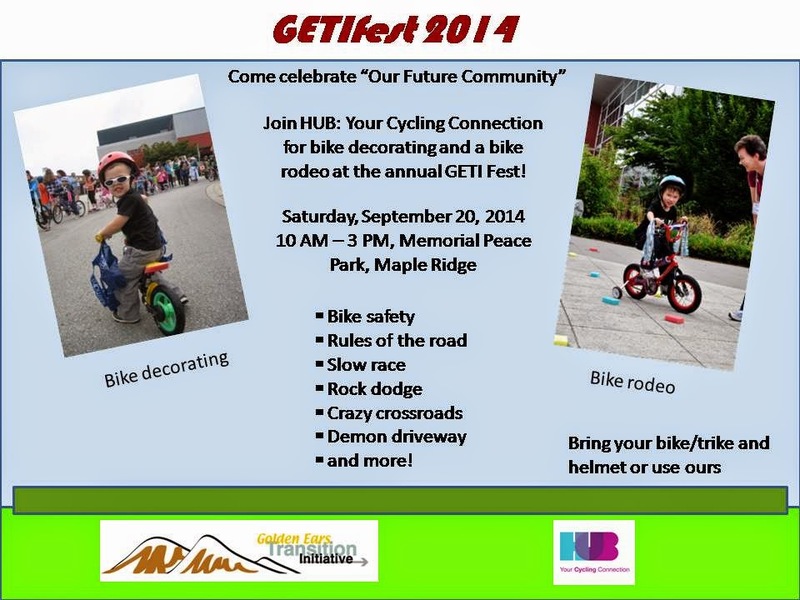 Maple Ridge/Pitt Meadows Cyclist: GETI Fest 2014, Sept. 20: bike decorating, bike rodeo and much more! GETI Fest 2014, Sept. 20: bike decorating, bike rodeo and much more! GETI Fest 2014 is fast approaching. Click on the link to find out more about all the exciting stuff that's happening this year. We're hoping to see lots of kids this year. Bring the kids' bikes so they can make them look great and practice their skills while having loads of fun. We have two small bikes and a few helmets available, so even if you don't bring any bikes, please drop by and use ours. I'm excited that eProdigy will be at the Station with some electric bikes for people to try out. Electric bikes are getting quite popular, especially in places that have traditionally seen more cycling. Besides regular bikes, electric bikes offer huge potential for communities that want to start transitioning away from our over-reliance on cars onto more sustainable and healthier modes of transportation. In more sprawling communities, like Maple Ridge and Pitt Meadows, with e-bikes more people will be able to bike for transportation more often, since they can more easily cover longer distances and hills are much easier to tackle. They also enable people with physical limitations to continue to stay active. The GETI Fest volunteer coordinator is still looking for lots of volunteers. We can use some too! If you volunteer through the volunteer coordinator, a free lunch is provided. It's good to state your preference if you want to volunteer with HUB, but it's kind of nice at the same time to be flexible and have something to do all the time. The numbers of kids at our station may vary throughout the day. I've arranged with the volunteer coordinator that she will send me volunteers as I need them, so hopefully that'll work out best for everyone. Please let Chelsa know if you would like to volunteer: cwebb@mapleridge.ca. To see the photos I took at last year's GETI Fest, click here.